Explore Manage Button Items screen. 6 5 4 3 2 1 SHIPPING & RECEIVINGThe “Receiving” section of ForecastRx is for customers who use Amazon Seller Central as their primary data source. Here, you have the ability to keep track of shipments Amazon has received and reconcile those inbound shipment quantities against your purchase orders and warehouse inventory. PURCHASINGThe “Purchasing” section of ForecastRx is where you can access automatically-created Suggested Purchase Orders based on your latest forecast results, your Custom PO Workspace and Saved POs you built using our app. ADJUSTABLE WORKSPACEGrids in the Manage area of the application allow you to View, Modify and Bulk Manage certain elements of your stored data. While you do have the option to employ company-wide settings applying to all items, any vendor or item-level settings will take precedence over these global defaults, allowing you to get results tailored to each item’s specific purchasing needs. 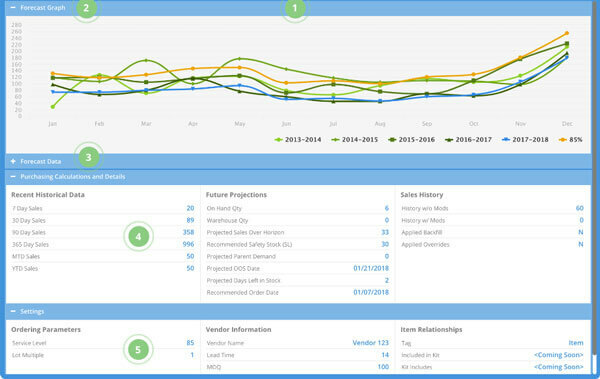 MODIFY SALES HISTORYThe “Modify Item History” section of the application offers three unique ways to modify your past sales data in order to improve forecasting accuracy. Popular reasons for modifying sales history are to adjust for stock outs, promotions, or other identified anomalies, as well as leveraging past sales history of a phase out item for its replacement. DATA MANAGEMENTHere, you can specify settings and ordering parameters for your company, vendors, and individual products. You can also view and adjust previous item demand and and outstanding Purchase Orders. MANAGEThe “Manage” section of ForecastRx allows you to modify your forecasting inputs and specific ordering parameters. 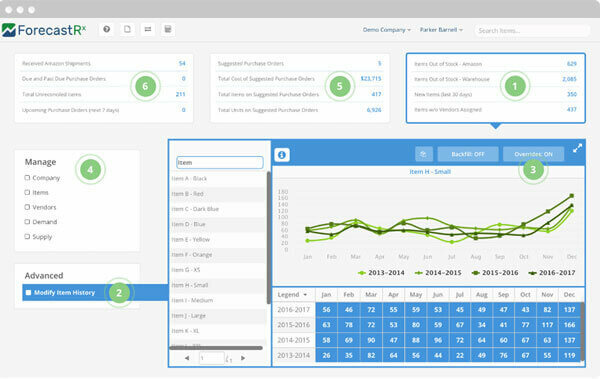 You can adjust sales and inventory data, customize your company, item & vendor settings, and much more to help us deliver the most accurate demand forecasts and purchasing recommendations. 6 5 4 3 2 1 1. 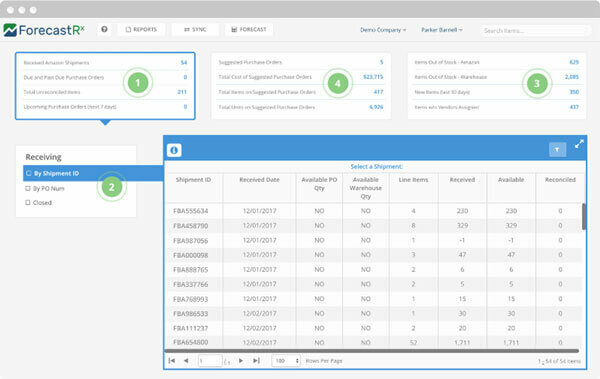 MANAGEThe “Manage” section of ForecastRx allows you to modify your forecasting inputs and specific ordering parameters. 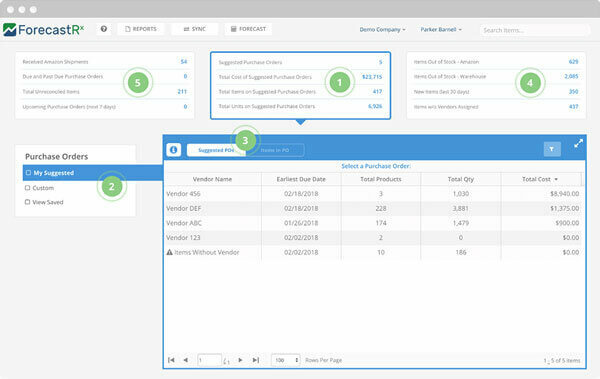 You can adjust sales and inventory data, customize your company, item & vendor settings, and much more to help us deliver the most accurate demand forecasts and purchasing recommendations.2. DATA MANAGEMENTHere, you can specify settings and ordering parameters for your company, vendors, and individual products. You can also view and adjust previous item demand and and outstanding Purchase Orders.3. MODIFY SALES HISTORYThe “Modify Item History” section of the application offers three unique ways to modify your past sales data in order to improve forecasting accuracy. Popular reasons for modifying sales history are to adjust for stock outs, promotions, or other identified anomalies, as well as leveraging past sales history of a phase out item for its replacement.4. ADJUSTABLE WORKSPACEGrids in the Manage area of the application allow you to View, Modify and Bulk Manage certain elements of your stored data. While you do have the option to employ company-wide settings applying to all items, any vendor or item-level settings will take precedence over these global defaults, allowing you to get results tailored to each item’s specific purchasing needs.5. PURCHASINGThe “Purchasing” section of ForecastRx is where you can access automatically-created Suggested Purchase Orders based on your latest forecast results, your Custom PO Workspace and Saved POs you built using our app.6. SHIPPING & RECEIVINGThe “Receiving” section of ForecastRx is for customers who use Amazon Seller Central as their primary data source. Here, you have the ability to keep track of shipments Amazon has received and reconcile those inbound shipment quantities against your purchase orders and warehouse inventory.